Home › buyers › In Southern California, new homes are rare and costly! In Southern California, new homes are rare and costly! On a busy stretch of Sherman Way in Van Nuys, a red and black sign advertises a rare commodity in Los Angeles. “Single detached homes. From the $400s,” it reads. The 63 houses — “small lot” townhouses that sit less than six inches apart — are unusual in a region with few new houses selling for less than $500,000, and even fewer anywhere near Hollywood. New home prices have soared in recent months, with the median for the six-county region peaking at $538,000 in June, according to CoreLogic DataQuick. In Orange County, the median new home price has topped $800,000. A surge in higher-end projects has pushed new home prices above their pre-recession peaks, even as prices for existing homes remain one-fifth below their bubble-era highs. 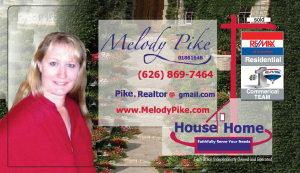 If you would like to consider your options for buying or selling your home, investment property please contact Melody Pike Southern California Realtor who works in both residential houses and commercial apartment complexes. Realtor serving Orange, Los Angeles, San Bernardino and Riverside counties. What are Melody Clients Say! If you do not live in Southern CA and do would like help finding a realtor in your area contact Melody she will help you. ‹ That’s why my home didn’t sell in Southern California?